Lady Bunny brings me right back to the late 80s. Her hair and her legs are incredible. Wow! That’s a lot of hair-covered muscle from Oosunaarashi, the hot Egyptian sumo wrestler. There’s been plenty of Mongolians and East Europeans, but Oosunaarashi is probably the first Arab to compete at the top level. Can this tool still become the next mayor of New York City? The latest image of Weiner’s junk makes the old one, covered in cotton underwear, seem positively modest. Carlos Danger has every right to continue to enjoy himself online, but enough with the politics, ok? Thanks to both the Daily Show and Colbert Report for sharing this image that can no longer be unseen. And thanks, Dirty! Ageha forbids cameras, so you have to forgive the poor image quality here from the phone. I go to late night clubs very infrequently. It’s surprising how little gay clubs have changed across time and continents. 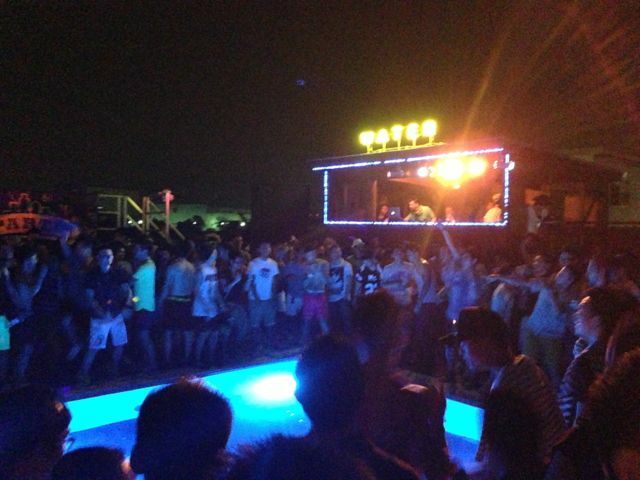 I like the pool and variety of DJs at the summer party. I would rate this pole dancer a high score for sheer strength, but a few deductions for form and costume. She’s my kind of lady. Sidewalk pole dancing lasted only a few rounds before the local policeman shut down this dangerous and/or immoral public display. The drag queen behind him is so mad her cup is popping out. Back to prettier people, did you see the pole dancing outside Advocates on their 10th anniversary? A free-standing sidewalk pole for dancing seemed like the best idea of the century. This big girl certainly looks festive! Sad to be missing this year’s Dore Street “Up Your Alley” fair. Check it out in San Francisco next week. Is that your torn Bible on the ground?